Gimpse: a moving dance installation, and sold out performance, by Dance Base. Performed at the Club 3rd and 4th of March 2019. 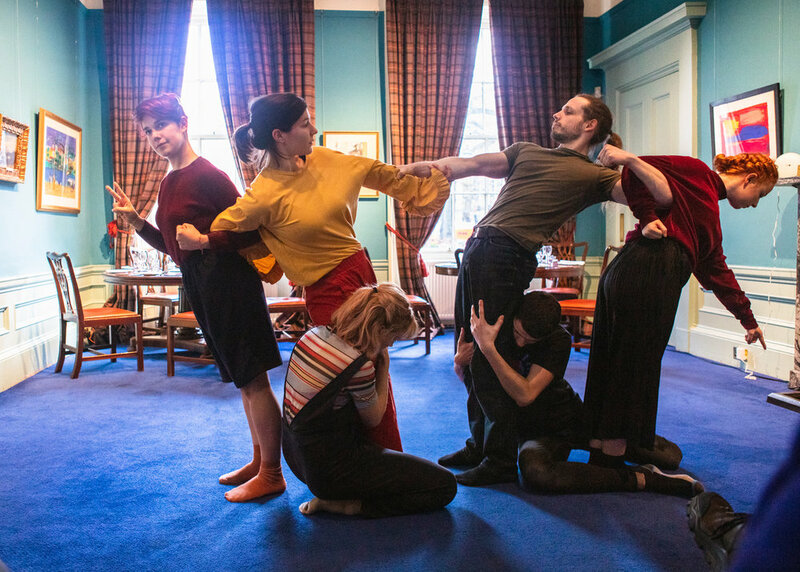 The work in the Clubroom, choreographed by Angus McLean Balbernie with 16 members of Prime, was so moving that I found myself close to tears: quite why is difficult to explain. You will hear others tell you what happened, but nothing can substitute for the actual live experience – the combination of words and music and movement which touches something so deep within you that you can’t work out where it is. The moods portrayed changed from anguish, to tenderness to joy, from isolation to belonging, the desolation of suffering alone, the tentative reaching out to others and the strength of sharing the pain. The speaker spoke of the sunset, the scream of nature, the nature of art and asked us to consider if art, or indeed our life, needs a frame. She then led us upstairs to the studio. In the glorious light of the studio, the narrator reminded us that art is to comfort the disturbed and disturb the comfortable. Alone, these observations would sound trite, but were given impact by the music and the dance, performed by five of the members of Prime. The whole experience was a roller coaster of emotions. The film in the Reading Room, which was entitled Rant consisted of disparate images and an expletive - ridden soundtrack which, may have a place in another setting, but for me, was rather incongruous. I would thoroughly recommend Glimpse and this thought provoking and sensory experience. Sketches (from left) by Club Members Joyce Campbell (no. 1) and Stuart Campbell (no. 2-4).